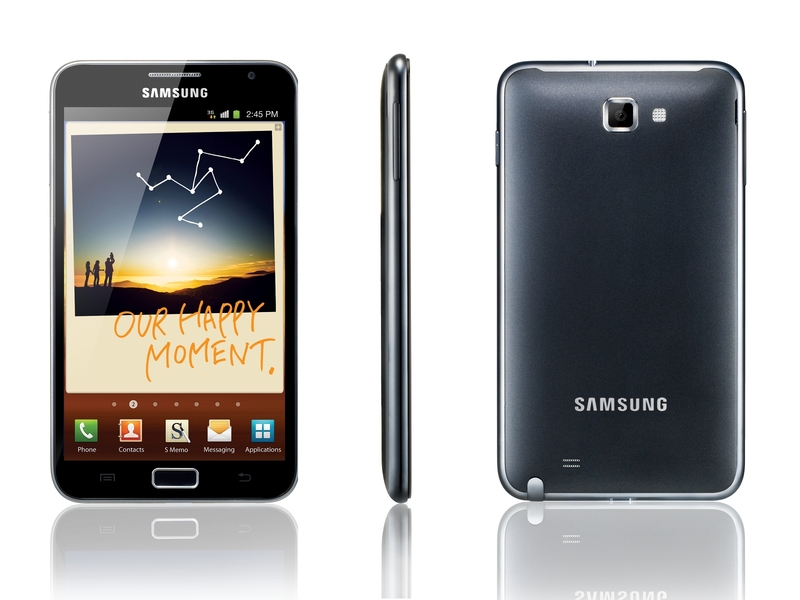 When we heard that two of the US variants of the Galaxy S II would feature 4.5" displays, we groaned. Super-sized displays make for huge form factors that can get comical before they get useful. We were further frustrated that resolution wasn't similarly upsized. With the Galaxy Note, Samsung seems set to challenge our presumption that a huge screen can't be portable, while taking the resolution higher than any phone it's previously introduced. At 5.3" this is the largest display on a phone device, eeking out even Dell's Streak, and the first that does away with HD qualifiers; this isn't qHD, this is HD (well, 1280x800 to be exact). The Note, notably, also introduces a pen interface to Samsung's lineup; S Pen is a capacitive stylus that tucks away within the device and seems to provide a similar level of function as found in HTC's Flyer. Anything you see on your screen can be annotated and shared. An S Memo app allows you to record audio, video, and handwritten or typed notes that can be played back and annotated. And of course the expected sketching app will be available for the artistic types. All of this is powered by a 1.4 GHz dual core processor with 1GB of RAM and can be paired with HSPA+ or LTE radios. It was surprising that no mention of what SoC is being used; this same sort of ambiguity has lead us to suspect that the T-Mobile SGSII variant isn't using Samsung's own Exynos SoC. We're reaching out to Samsung for more information, but at 1.4 GHz we expect the device to be no slouch in performance. Software wise, this is presently a Gingerbread device running TouchWiz, now optimized for pen input. In addition, a split screen mode is being introduced for "the most commonly used native apps." That's not a lot of information to go on, and the demo didn't provide many details, so we'll be looking for more clarity there. As seems to be the norm of late, there has been an effort to make this device enterprise friendly so Juniper Junos Pulse is included for secure network access. An 8MP rear facing camera with LED flash and a 2MP front facing camera effectively check those boxes. And with a 2500 mAh battery, Samsung is clearly doing their best to make this an all day device (Editor's note: 2500 mAh was quoted in the keynote and on the slide deck but the PR shows the standard battery as 1200 mAh.). Recently, Samsung introduced their full lineup of device tiers, a series of letters following the word Galaxy that identifies a particular device as belonging in a category (midrange, high-end, etc.). The big message during the keynote, was that the Note is not a member of any of those categories, rather it was a new category and a new market segment. Larger than a phone, smaller than a tablet, without sacrificing any of the functionality of either. Building new product categories is a risky venture, but Samsung believes that there's a segment of the market that is not well served by a phone sized device and would rather not carry a tablet and a phone. The Galaxy Note intends to fill this gap, we'll be interested to see how well it performs. Whether you love them or you hate them, Samsung's Super AMOLED displays are here to stay, and that includes tablets. 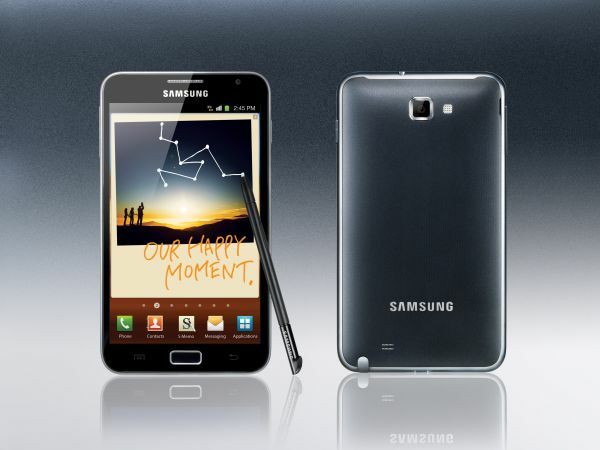 At 7.7" this is the largest Super AMOLED screen available, and, along with the Galaxy Note, among the first to break past WVGA. 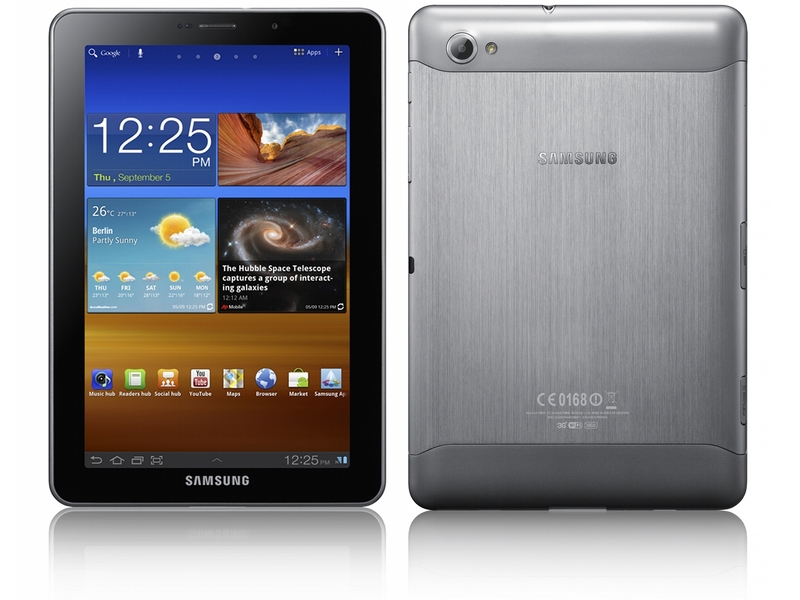 The 1280x800 resolution makes this the tablet with the highest pixel density on the market. It will also be the thinnest and the lightest at 7.89 mm thick and 335 g. The form sets it apart from most other tablets on the market, and the thin frame will make this very pocketable. The rest of the specs are pulled from the Galaxy Note on the hardware side and the Galaxy Tab 10.1 on software. The same unnamed 1.4 GHz SoC will power the device, as in the Note; while TouchWiz UX will grace Honeycomb, though Android 3.2 is used in this variant. Samsung is rebranding it's e-bookstore as Reader Hub, while also adding Game Hub to the team that already includes Media Hub and Music Hub. Details were scant but this will provide a unified interface to purchase and launch premium and social games. A 3MP rear facing camera and a 2MP front facing camera are featured, and a microSD slot returns, having been absent on the Tab 10.1. The 5100 mAh battery is promised to last up to 10 hours in video playback, and as always, pricing and availability for neither of these products was offered. I was actually hoping for a kickstand on it. There might be a fashion issue when holding it against my ear.. f*ck the fashion police. They already tried to object to my HD2, and ended up looking very reactionnary) plus I can always use a headset. - I'm using my phone a lot more as an ereader, mp3 player, RSS reader than as a phone. With the 5.3" screen, I can do all that better, plus maybe start browsing the web, reading comics, and watching videos, all of which I currently do on my tablet or netbook. I might even be able to start doing patch-up Office work, via Google docs or QuickOffice. - the pen could be a killer app, I was looking for a Pen tablet (Thinkpad Tablet ?). It really depends on how good the hardware and software are though. I have an x210T, and I LOVE it. If you actually need to take handwritten notes, a convertible tablet PC and OneNote are great. There are multiple sources now that show the international model of the Galaxy Note does indeed have the Exynos chipset (as well as a 2500 mAh battery). It is the US versions that Samsung occasionally has to switch to Qualcomm chips due to native support for the radio bands we us use. Indeed the T-Mobile SGSII swapped out its 1.2GHz Exynos for a 1.5GHz Snapdragon and according to rumors, the same will happen to the AT&T version of the Note to support their LTE network. This move is not without precedent as the AT&T SGSII Skyrocket was cannibalized in the same manner. This is unfortunate as the Exynos GPU, as the SGSII review on this site revealed, is much, much more capable than Qualcomm's offerings. Basically, Samsung sacrifices CPU/GPU performance for hypothetical download speeds to make US carrier's look good. So if you want the REAL Galaxy Note- import it. You'll actually get the ICS update if you import it too- the US variants never do.